Until 20 March, the Stirling Smith has the privilege of hosting the famous Ryder Cup Heritage exhibition. The ancient Royal Burgh and City of Stirling has golfing heritage of its own. It is recorded in the accounts of the Lord High Treasurer of Scotland that on 29 March 1506 James IV bought seven golf balls for a game while staying at Stirling Castle. Naturally, the collections of the Stirling Smith Art Gallery and Museum reflect the importance of the game to Stirling, and featured today is ‘a Gourlay Feathery’. 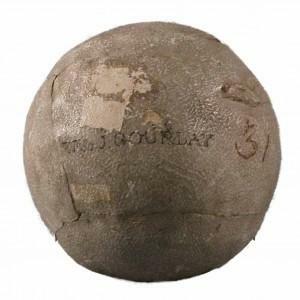 These balls were made of goose feathers, sewn into a leather covering, and were made by the Gourlay family from the 18th century until the gutta percha ball came into general use in the 1850s. The ball is marked with the manufacturer’s name. The number 31 refers to its weight in drams, avoirdupois (approximately 2 ounces). In November 1839 an ancient Hindu sculpture was gifted to the St Andrews Literary and Philosophical Society by Reverend James Paterson. It arrived, packed in gutta percha, a black, rubber-like resin from the Isonandra Gutta tree. According to an article in Golf Illustrated, 1902, gutta percha was first employed in the manufacture of golf balls in April 1845. Gifted by Miss Murrie of Snowdon Place in 1930, it is likely that the Gourlay was played on the Kings Park course in the 1860s.